Book a driving lesson with Book Learn Pass today and learn to drive with one of our fun, professional driving instructors in your local area. Our lessons are affordable, you will be taught how to drive in a relaxed environment and we have helped hundreds of learner drivers pass their driving test over the last few years. To get started fill in the contact form on this page and one of our friendly customer service agents will be in touch as soon as possible. Do I Need To Pass My Theory Test Before Booking a Driving Lesson? You do not need to pass your driving theory test before booking a driving lesson. As long as you are over the age of 16 and posses a valid provisional driving license, you can legally learn to drive. You can be taught by either a qualified driving instructor, or a friend or family member over the age of 21, who has held their driving license for 3 or more years. In our experience, learner drivers who study for their theory test as they learn to drive, progress quicker than learner drivers who do not, as learning road signs and markings makes you a more aware and mindful driver. What’s a provisional driving license? The cost of a driving lesson tends to vary by your location, the type of lesson you are interested in and how long the lesson lasts. New learner drivers who are just starting out can enjoy reduced rates through our introductory driving lessons and the average cost of an hours tuition is currently £19. What To Expect From Your First Driving Lesson? Most learner drivers will feel a mixture of nerves and excitement before their first lesson and this is to be expected. During your first lesson you will be taught how to move the car, what each of its controls do and learn an important set of safety checks. Your initial lesson is a time to familiarise yourself with the car, the road and your driving instructor. For more information on what you can expect on your first driving lesson read our guide on the topic here. What Type of Driving Lessons Can You Choose? These are our most popular driving lessons and most learner drivers opt to practice in a manual car. In a manual car you have to change gears yourself and mastering clutch control is essential for completing driving manoeuvres and changing gears. We also have automatic driving lessons available too. Automatic driving lessons tend to be a lot easier than their manual counterpart, you will reach test standard at a much quicker rate and it’s a popular lesson type among many learner drivers. The only drawback of this particular lesson is that when you pass your driving test in an automatic car, you are not permitted to drive a manual car with this particular license. If you find you are too busy during the working week to learn to drive, fear not for you are not alone. Juggling work, education, a family and a whole host of other commitments can make it difficult to find the necessary time and for many learners the weekend is the best opportunity to practice. We offer weekend driving lessons for learners who prefer to practice on either a Saturday or Sunday and this is one of our most popular options. Many learner drivers prefer to learn to drive with a female driving instructor. A female instructor can help you feel more relaxed behind the wheel and this is important especially during the initial stages when learners are at their most anxious. All our female instructors are well trained and fully qualified and if you would prefer to learn with a female instructor we can help you get started as soon as possible. Getting behind the wheel for the first time can be a daunting process and it is quite normal to feel nervous before the start of your first lesson. If you are feeling apprehensive, you can start out with our introductory driving lessons and these are designed to get you used to the vehicle and the road in a quiet setting. These lessons take place on residential roads away from busy traffic and they are ideal for learner drivers who want to start off at a slower pace. You will cover a wide range of topics when you learn to drive with BookLearnPass. Our aim is to develop you into a mature, responsible driver capable of driving with confidence at all times and whether you are novice driver with limited experience, or you have taken lessons in the past, we will ensure you cover all topics in the driving syllabus. Subjects are split into beginner, intermediate and advanced as shown in the table below. How Many Driving Lessons Should You Take Before a Test? Learning to drive can be a long process and as individuals learn at different speeds, some learner drivers will progress quicker than others. On average it takes around 40 hours of training with a fully qualified approved driving instructor and 20 hours of independent driving with a friend or family member to reach test standard. 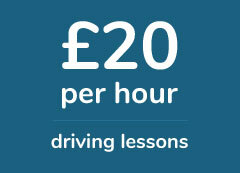 If you take a two hour double lesson each week, you will be ready to book a driving test in around 5 months. Read our guide on how many driving lessons you will need before booking a test. Once you have taken enough lessons and your instructor feels you are ready to take your driving test, we have a range of articles and guides in our driving test tips section to help you prepare for the big day. We recommend all learners go through these resources to give themselves the best chances of passing on the day. Let us book a driving lesson in Hornchurch for you, with a qualified and verified driving instructor in the area.